Every day at the Y, hundreds of Active Older Adults participate in our programs and around the facility. Whether through group exercise classes like Forever Young or SilverSneakers or just coming in to exercise and share a cup of coffee with your friends afterwards, the Y is known for providing a caring atmosphere for our seniors. A great way to get yourself moving! These classes move to the beat of the music and are fun ways to do some light cardio and resistance training all while being supported by a trained instructor and your classmates. Please click the image below to enlarge the descriptions. Please enjoy this video of our Active Older Adults engaging in their health and wellness during a land class. A unique physical activity program designed to encourage Medicare members to increase their fitness level. Based on the concept on fitness, fun, and friends, these programs enhance independent living skills. Both land - chair and standing classes - and pool classes are available. These programs are sponsored by Humana Insurance. 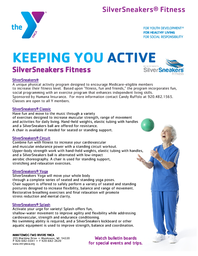 Click here for the national Silver Sneaker website and more information. Our trip program takes you to different parts of our area for lunch and shopping or taking a boat ride on beautiful Lake Michigan. Different trips all year long. Check them out.